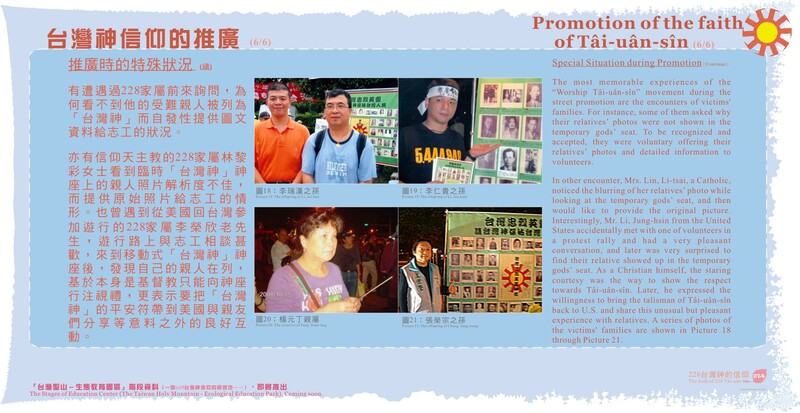 The most memorable experiences of the “Worship Tâi-uân-sîn” movement during the street promotion are the encounters of victims' families. For instance, some of them asked why their relatives’ photos were not shown in the temporary gods’ seat. To be recognized and accepted, they were voluntary offering their relatives’ photos and detailed information to volunteers. In other encounter, Mrs. Lin, Li-tsai, a Catholic, noticed the blurring of her relatives’ photo while looking at the temporary gods’ seat, and then would like to provide the original picture. Interestingly, Mr. Li, Jung-hsin from the United States accidentally met with one of volunteers in a protest rally and had a very pleasant conversation, and later was very surprised to find their relative showed up in the temporary gods’ seat. 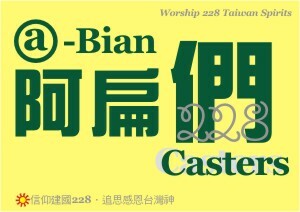 As a Christian himself, the staring courtesy was the way to show the respect towards Tâi-uân-sîn. Later, he expressed the willingness to bring the talisman of Tâi-uân-sîn back to U.S. and share this unusual but pleasant experience with relatives. A series of photos of the victims' families are shown in Picture 18 through Picture 21.